Easy to install and remove, 1 year warranty. Why Choose TWOOC Bicycle Accessories ? Auminum valve caps may be seized valve stem if meet acid or alkaline liquid envoiroment, pls make sure loosen them at least once per month! Your satisfactions are very important to us, please don't hesitate to contact us if you have any questions. We'll try our best to assist you within 24 hours. 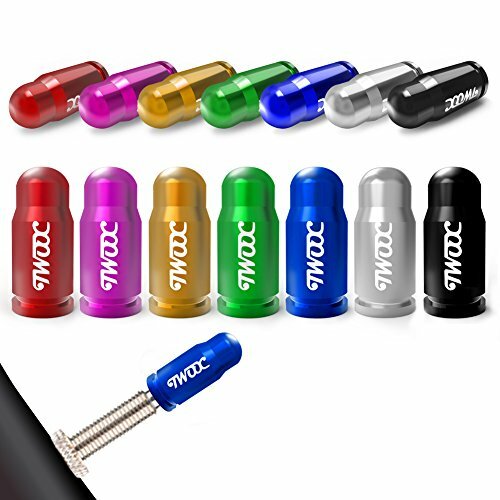 Quantity and Colors: Anodized aluminum presta valve caps 14 pcs/Lot - 2 of each color (Black, Red, Silver, Blue, Gold, Purple, Green ). High Quanlity: Specially made for bike customization. Preventing air-leakage, top quality 7075 aluminum and anodized 7 colors. Personalize your bike with styles and colors. Top Quality Ultra-Light Caps: Weight only 0.7g per piece. Easy to installation. General Accessories: High quality universal fitting for road bike. The valve stem cap are durable, rustless, antioxidant in extreme weathe. 100% Money-Back Guarantee: If you are not happy with your purchase for any reason, we will take it back! 1 year warranty,any quality questions within1 year can be solved in properly. If you have any questions about this product by TWOOC, contact us by completing and submitting the form below. If you are looking for a specif part number, please include it with your message.